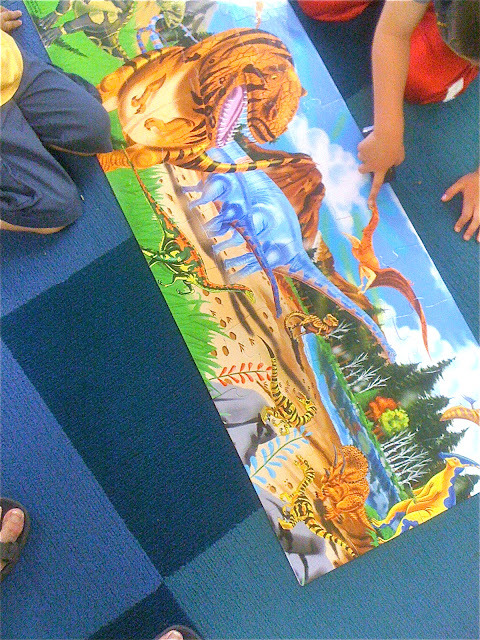 I have a love-hate relationship with puzzles in our classroom. On the one hand I'm very pro-puzzle: I might not be the world's most avid puzzler, but I've always enjoyed the intellectual challenge. On the other hand, the way our classroom is set up, more often than not, when there are puzzles out, if I turn my back for a second, I return to find them dumped out on the floor or table top, pieces neglected and scattered, uninviting to even the children most apt to take them up. 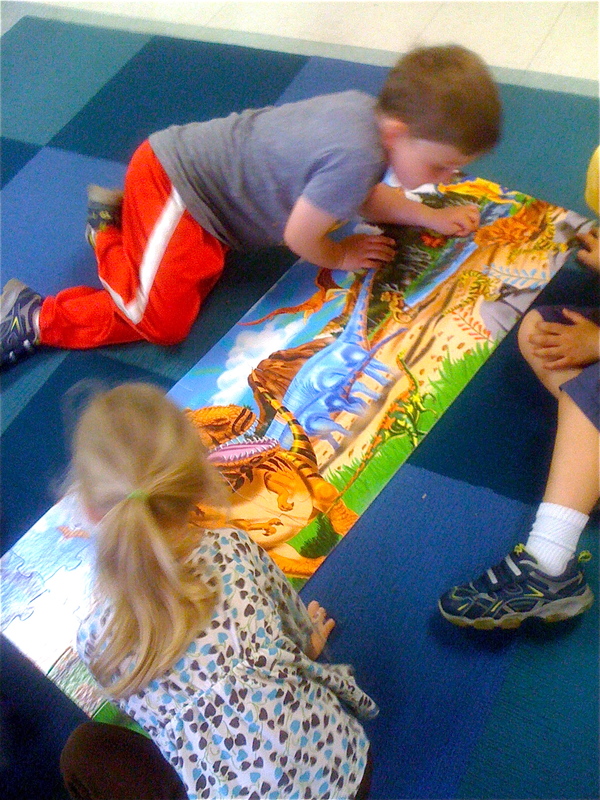 Puzzles live in a kind of strange place at Woodland Park where we don't obsess over "the right way" and where making mistakes stands at the core of our curriculum. There is, after all, a right way to assemble a puzzle. Or rather, there is a correct answer that may be reached by many different paths, but ultimately everyone produces the same result. And I suppose that's why some kids find puzzles so frustrating. I reckon that's why, every time we're playing with the puzzles, there are some who can't bear to walk past without dumping or otherwise making a mess of them before walking way. Maybe it's like a sort of statement of, "Screw you" or a "You're not the boss of me!" Another dynamic at work, I think, is that puzzles, at least for me, tend to be a kind of solitary activity and our school is essentially a social place. I've seen a lot of kids look longingly at a puzzle, apparently attracted to the picture and the challenge, kids whose parents report will work puzzles for hours at home, but who just walk on by in the classroom, drawn away by the more social prospects of dramatic play or a group art project. So we have those things working against us every time puzzles make an appearance. 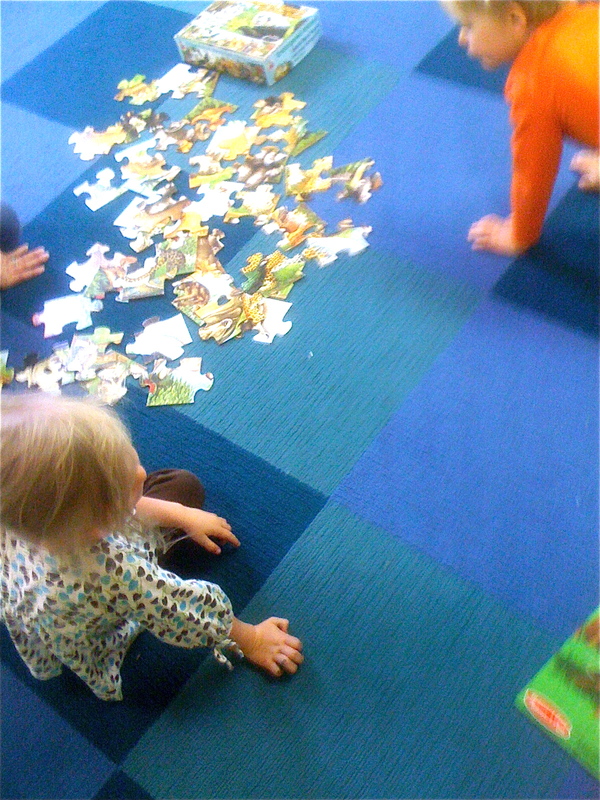 I go through flurries of trying to figure out how to make puzzles work in our classroom and every time my conclusion is that there needs to be an adult there, not to help the kids assemble the puzzles exactly, but to help make it a social, cooperative, goal-oriented activity. And maybe that's the nature of some goal-oriented activities, to need a kind of leader or guide willing and able to hold the big picture in mind as everyone else works on the details. One of Woodland Park's most glorious puzzling days was a few years back when master-puzzler Sasha took charge of a group of older boys, guiding them step-by-step through the assembly of a large, complicated floor puzzle, a project that engaged a half dozen kids for at least a half hour. What Sasha did so brilliantly was to start by getting her team to buy into her strategy, which involved, first studying the picture on the box, then turning all the pieces face up so you could see them. She then had them start with the most prominent feature in the picture and work outward from there, the opposite of the usual adult strategy of looking for corners, then edges, in a process of building toward the center. I'd noticed that with my own daughter, who was never a big time puzzler. If she was going to tackle a puzzle it was because there was something at the heart of the finished puzzle that attracted her -- a princess, a butterfly, something -- and that's where she always wanted to start. This is the approach I've been using with Woodland Park's puzzlers: doing my best Sasha impression. I start by looking at the box or fully assembled puzzle and declaring something like, "I'm going to work on this T-Rex," to no one in particular. This will typically draw-in at least one kid, which is enough to get going. 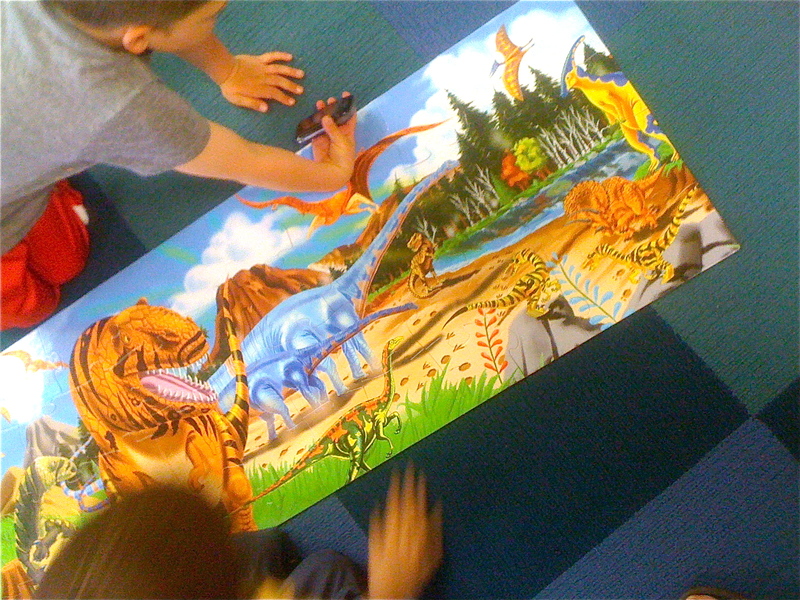 "First we need to find all the T-Rex pieces." Switching from "I" to "we" is my invitation for others to join me. I begin by turning all the pieces over so we can see them, while the kids help me hunt for pieces that seem to go with the T-Rex. I try to maintain a steady banter, keeping our immediate goal in front of us -- in this example the T-Rex. We'll usually start attracting other children, some who just want to watch. Others join in. And some decide to go to work on their own part of the puzzle. "I'm going to make the triceratops." "I'm collecting sky pieces." As new children arrive on the scene, I give them an update on what we're doing: "Audrey's working on the T-Rex," "Luca's making the triceratops," "Mason's collecting sky pieces," each comment an invitation to drop to your knees and join us. Some useful statements I learned from Sasha are: "If you sit on the puzzle you'll break it," and "Okay, everybody stand up. Somebody must be sitting on a piece." Naturally, there are still many kids who continue to look upon our efforts with disdain. And there are some who are clearly itching to reduce our efforts to smithereens. That's another reason I stay nearby, to protect our efforts by serving as an reminder of self-control, and by assuring these kids that clean up time will come: if they just have a little patience, they will ultimately have their day.